It’s been a while since I last penned a blog but recently I was asked to photograph Bradley Wiggins for an old friend of mine, Yanto Barker, who owns the cycling apparel brand, Le Col and this got me thinking about Brad’s career and when I first came across him in 2001 when he was riding the Wally Gimber race in Tenterden, Kent. He was riding in Team GB colours after his first pro team, the Linda McCartney squad had collapsed suddenly. I was spectating that day and supporting my friend Martin Markowski, a talented sprinter who had made it into the break with Brad and several other riders. Watching bike races can be pretty boring at the best of times so to amuse myself I took my camera along. Unbeknown to me I was witnessing the rise of a future star who was already starting to demonstrate his pedigree. As the race neared the critical last lap I was too absorbed, happily snapping away to notice my friend screaming for a bottle who despite his good form needed water badly. This spelled the end of his chances as the decisive split went and Brad took the win. Needless to say Martin wasn’t too pleased but I had taken my first shots of Bradley without really knowing who he was or would become. It was nearly 10 years later before I met Brad in person. My career as a photographer had taken off and I was asked to photograph him for adidas when he first joined Team Sky. This was a big deal for adidas who had vowed never to get back into professional cycling after being burnt so badly by the Team Mobile affair. Brad had risen to fame after placing 4that the Tour de France (later promoted to 3rdafter Armstrong’s admission to doping) and was now Team Sky’s hope of winning the Tour. As a keen cyclist I was excited about photographing and meeting him, hoping to come away with an insight into the man that was being touted as our first potential Tour winner. I knew he had a reputation for being sharp witted and renowned for his impersonations of various Team Sky riders and staff but contrary to this, I found Brad quite reserved, preferring to get the job done without feeling the need to entertain. He was certainly professional and the shoot went off smoothly and we parted ways with me none the wiser about the man I had just photographed. It was another few years later before I got the opportunity to photograph him again. By now he was a house-hold name not just within the cycling fraternity but nationally and in some respects globally. He had star status and a confidence which was sometimes interoperated as arrogance. Team Sky were now the most important team in the world and were gathered in Surrey for their October get together along with various media and press. I was there to shoot adidas’s new season ad campaign. By now everything had geared up a notch, the shoots were more complex and the entourage bigger. The concept involved getting the several team members to ride on turbo trainers together looking like they were in a race with Brad leading the charge – “Game Face”! Unfortunately, Brad was having an off day for whatever reason and decided not to play ball, preferring to pedal in his lowest gear with a blank expression more akin to riding a shopping bike than in the last throws of a race. Game Face wasn’t happening. It took a little intervention (a quiet word) from his friend, Mark Sinclair (adidas) to bring the shoot back on track to get the required shots. I witnessed a different Brad that day and wondered whether celebrity status had got the better of him. Looking back, I actually think he was uncomfortable with the situation. If there’s one thing Brad doesn’t like, it’s contrived situations. The idea of riding in a studio on turbo trainers against a green screen trying to replicate a real race was fake to him and he was being asked to take part in something he didn’t believe in. Unfortunately, media days are part and parcel of the modern sport and Brad’s image had become public property. Fast forward 8 years and a few more Olympic gold medals plus the World Hour Record, Brad has retired from pro cycling and now taken up rowing, going from 68kg (his Tour weight) to nearly 100kg with the help of protein shakes. There’s been a few images changes over the years but now he is unrecognisable with a big mop of hair and beard akin to Robinson Crusoe. It’s hard to relate this look to a cyclist but this is Brad now, enjoying retirement. The rowing and new look are a challenge to people’s public perception of him. 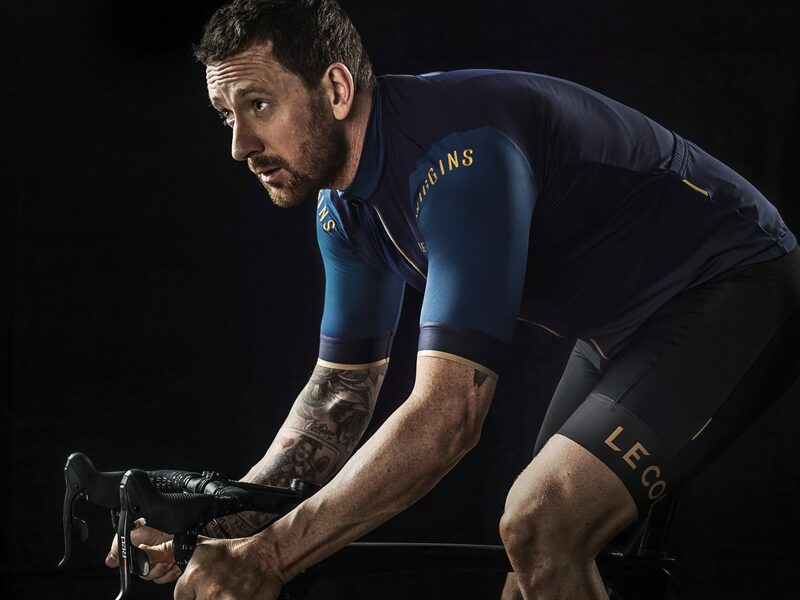 It’s also an interesting proposition for Le Col who have collaborated with Brad to design a “Wiggins” range of cycling kit and need his image to help promote the range. 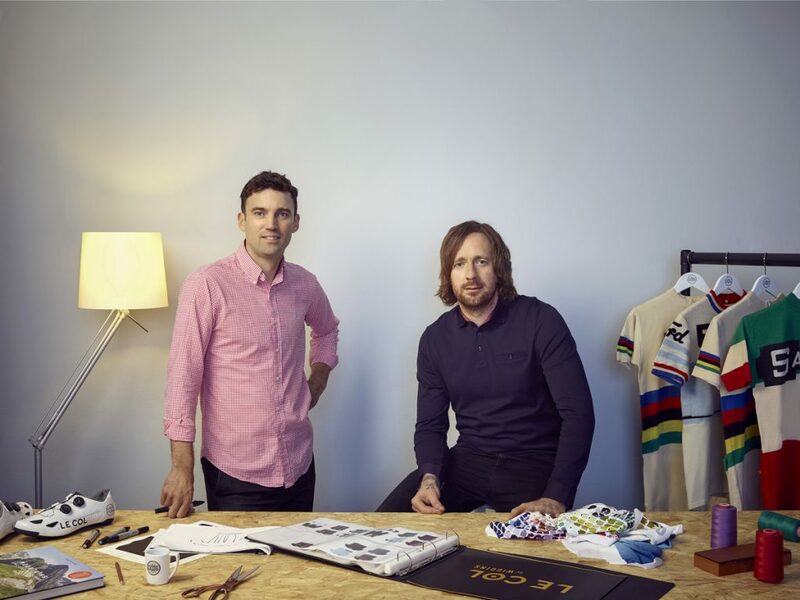 Fortunately the campaign I’ve been asked to shoot doesn’t require Brad to look sporty, this time the concept revolves around Brad sitting in a studio scamping new designs for jerseys alongside his ex GB teammate and owner of Le Col, Yanto Barker. This is a step away from “Game Face” and shots of Brad on a bike, and whist the story that is being depicted is true (he’s had a direct input into the designs), the set is fake. Brad senses this and I know I’m in trouble when he starts to doodle comic images on the designer’s notepad. I try to go with the banter but I’m acutely aware I’m loosing ground and the possibility of getting a good shot. Yanto sense this too and comes to my rescue to help steer Brad back on track. This is the difference between working with models and celebs such as Brad in these constructed environments. Models will play the game but celebs hold the balance of power and will give only as much as they are willing to do. Brad is smart though and fully understands the wider game that is at play. This is just banter and he appreciates the need to promote his image to maintain his market value. 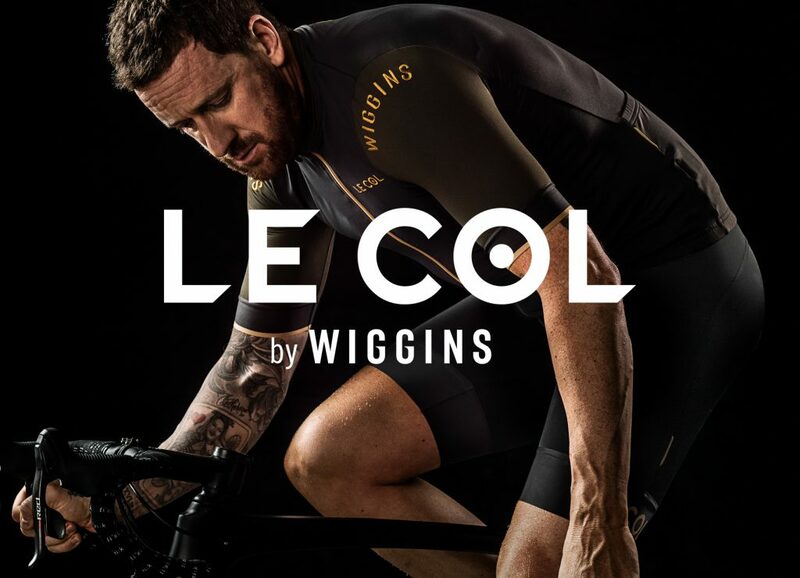 Likewise, if the new range of Wiggins, Le Col is to be a success, it needs him to promote it. So it was with some trepidation that I embarked on the most recent shoot with Brad and Le Col a few weeks ago. We are back in the studio with a similar set to the very first shoot for adidas back in 2001. In fact it’s the same studio. This time Brad is onboard, he’s seen a few test shots, the lighting and set are good and it’s authentic. The mop of hair has gone in favour of cropped sleek look not dissimilar to his racing cut (he knows what’s required). He genuinely likes the range of kit he has designed and is now promoting. He’s compliant, friendly and happy to play along. This is the most relaxed shoot I’ve done with Brad. The shots look good and I heave a sigh of relief. 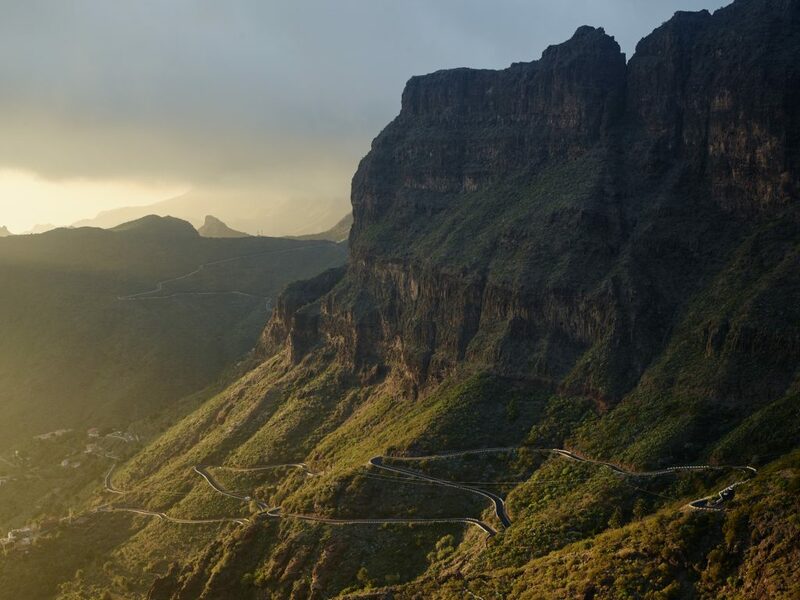 Although I barely know Brad there’s a couple of things I’ve learnt and witnessed – he’s a very intelligent guy, who has a great understanding and love of cycling. He is one of the most knowledgeable guys on the history of the sport and is a passionate collector of cycling memorabilia. I’m sure he feels a responsibility to honour the history of the sport and hence doesn’t want to put his name to anything he doesn’t firmly believe in or which dis-credits cycling.